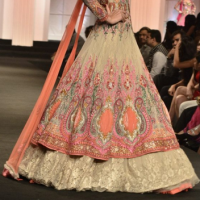 Indian Couturier Anjalee & Arjun Kapoor are the market leaders in the Indian Haute Couture. They have a rich 22 years experience in designing high end Indian ethnic wear clothing line. Brand Anjalee and Arjun Kapoor is the top Indian wedding dress designer brand and has always lent their aura of opulent design to men's wear, women's wear and precious jewellery. Their journey started 20 years ago and since then, the brand has set new milestones in Global Fashion industry. Anjalee and Arjun Kapoor have established themselves as the front-runners in the Indian fashion scenario. They have a high profile clientele that includes names like Deepika Padukone, Katrina Kaif, Anushka Sharma, Bipasha Basu and many more. The Store is located in Mehrauli, New Delhi and is open from 11:30 AM to 8 PM.